Shade density has a lot to do with comfortable outdoor living here in the Valley. 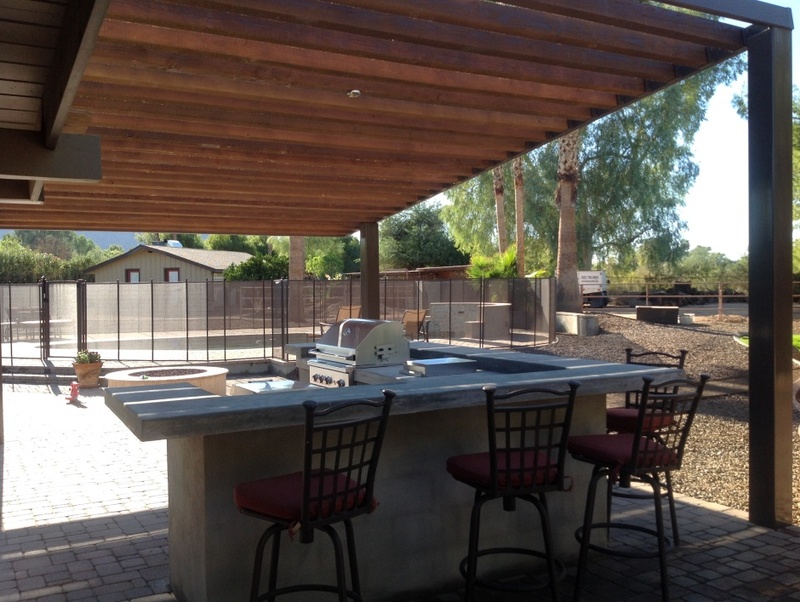 For your Scottsdale patio design the best instant shade will be from ramadas or shade structures with a solid roof. Solid roofs, as you might assume, are going to be the expensive option. But that’s the one size fits all solution. There are other ways to go about getting good shade without waiting for a tree to mature. The trick is all in the shade structure design and engineering. Here we used metal support beams. They are less expensive than solid wood posts and no maintenance thanks to the factory applied rich colored finish. Next we created nearly solid shade with a widely spaced slatted roof. Ah, the marvels of engineering and putting the sun to work FOR you. Firstly, you’ll get far wider shadows from a slanted pergola or ramada roof. Secondly, the height and width of the roof slats affects the width of the shadows it casts. Normally, to get this much shade from a shade structure like this the boards would need to be placed quite close together. By angling the roof height the full effect of the 2″ x 6″ planks installed is very close to what it would be without any spacing at all. Using 2×2 or 2×4 roof slats would have decreased the shadows the slats cast tremendously. The finished design is very modern with an emphasis on natural materials. The amount of shade while sitting at the grill island bar is wonderful. You won’t get this much relief from average pergolas, Scottsdale.